Gyula (pop. 35,000), a nostalgically pretty and popular spa town, lies near the Hungaro-Romanian border 16km (10mi.) 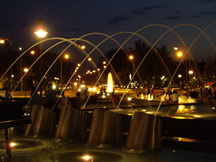 southeast of Békéscsaba on an arm of the White Körös river, attracting over half a million visitors during the summer season, in addition to festivals held virtually every week of summer. The town was first officially recorded in 1214 as a monastery; its castle was captured by the Turks in 1566 and until they were driven out in 1695 it was the capital of a sa ndchak, or administrative district. The new lord of the manor, the Austrian Baron Harruckern, built a palace near the castle in 1720 and imported German workers who established themselves with their own town administration in what is now known as “German Gyula”, to the left of the present-day avenue Béke sugárút. To its right lies Hungarian Gyula. Later on Harruckern invited Romanians into the country, and today Gyula is still the center of the Romanian minority. There are several Romanian organisations in Gyula – the Center for the National Self-governance of Romanians living in Hungary and the Romanian-Hungarian Cultural Union. From the meat factory in Gyula comes “Gyulai kolbász”, a richly-spiced sausage.